Most children have at least a passing idea of the story of Noah’s ark. It’s often presented as a fun Bible story, and you can’t miss the cutesy, round ark with the giraffe’s head poking out the roof on wallpaper, light switches, games and toys. Sadly, many children have little or no concept of the truths behind the real story. The purpose of this Noah's ark VBS program is to give the children a true account of this story, along with five other parallel Noah's ark VBS stories that reinforce the Bible truths of the flood account. Children will also enjoy the opening Noah's ark VBS devotion presentations by members of Noah’s family. The Noah's ark VBS course is priced higher than the other courses because it includes a 6-foot model of the ark that the students build. This course also highlights a special Noah's ark VBS musical that the students learn throughout the week in place of songs. This makes an ideal parent or church presentation after the school has completed. Noah’s presentation: God was just in destroying the world with a flood. Classroom story: God was just in Achan’s judgment at Jericho. Shem, Ham, and Japheth’s presentation: God was good to Noah and his family. Classroom story: God was good to baby Moses and his family. Noah’s wife’s presentation: God showed Noah how to build an ark to save his family and the animals. Classroom story:God showed Moses how to build a bronze snake to deliver God’s people. Noah’s presentation: God cared for Noah and his family while in the ark. Classroom story: God cared for Elijah during a famine. As with all Kremer VBS programs, there are lessons ranging from preschool through adult. This means that the Noah's ark VBS program can be used for a standard Vacation Bible School or an evening Family Bible Week. The lessons have been specially written to present the children with the pure message of law and gospel. With the purchase of the program you will receive all lessons in black/white and color. There are also duplicate lessons based on either the King James Version or New International Version (1984). The Let's Build an Ark Vacation Bible School program is entirely reproducible. This means that all Noah's ark VBS materials on the disc can be printed, duplicated, and used as often as you wish. The only restriction is that the programs are not to be resold. Every Vacation Bible School lesson comes with a complete teacher’s guide and a special “Background and Application” study guide. Full color pictures recommended for lower grade classes are also included. Build a 6' Model Ark! The Noah's Ark model design includes complete instructions for building the ark, designing the 4' x 8' platform it rests upon, making the animals, and painting an 8' rainbow as a backdrop. This model should be displayed for friends and visitors on the final day of VBS. Be certain to take photos of your children or classes standing beside the ark model! 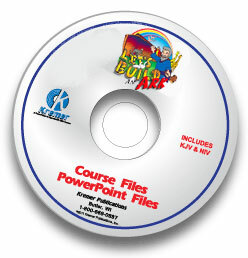 Includes full Noah's ark VBS course reproducible/printable CD PLUS sing-along and full accompaniment CD for the musical. You will also receive the six-foot ark model and a large wall blueprint of the ark. You will instantly download the complete Noah's ark VBS course as would be found on the CD and the music will be in MP3 format. The ark model and the large wall blueprint will be shipped separately at no additional charge. To add to your youth and adult studies, you may want to present this outstanding 25 minute DVD . Here you will be shown a fascinating feasibility study of the ark and how it may have been assembled. Blank transfer papers will enable volunteers to print full-color zoo VBS iron-ons for light colored t-shirts. All that is required is an ink-jet printer and a t-shirt. The templates are on the program disc. NOTE: We no longer stock the blank transfer iron-on paper. This can be found at your local office supply store. These full color Vacation Bible School posters measure 11” x 17” and are ideal for advertising Noah's ark VBS in your church and throughout the community. Print for yourself doorknob hanger blanks come on 8½” x 11” paper  perforated two-up. (50 sheets will yield 100 hangers) Bags hold 5½” x 8½” flyers and come with die-cut hole for easy hanging. The following three DVD's are generic in nature and do not reflect any one course from Kremer Resources. DVD songs are not course songs. Don't let the title fool you. These classics are enjoyed by kids of ALL ages! These ten sing-along favorites will delight your kids. This CD can be used for any Vacation Bible School program year after year including the Bird Tales VBS. Although third of a set, this is the first Kid's Worship - and it's GREAT! Each song is actually a medley of a contemporary song coupled with a well-loved traditional hymn. Choose some to sing the introductory song and have the entire assembly join in on the classic hymn tune. These songs can be used with any Vacation Bible School program including the Firefighter VBS.